A word that recurs regularly in An Anthropocene Primer is “concept.” Already, we have referred to the “Anthropocene” as a “concept” multiple times. There are numerous concepts that we use throughout this Primer. In fact, one key theme of the text is to help users identify concepts, to complicate their meaning, and to help clarify their understanding of the Anthropocene. For example, the Anthropocenoscapes activity is fundamentally concerned with concepts and their classification. When we use the word “concept” in this Primer, we use it in one of two ways. First, we might use “concept” to refer to a complex, abstract idea. This could be a philosophical idea, such as “justice,” or an idea in the social sciences, such as “developing nations.” Second, we might use the term “concept” to refer to an abstract model that helps explain a set of natural or social phenomena. 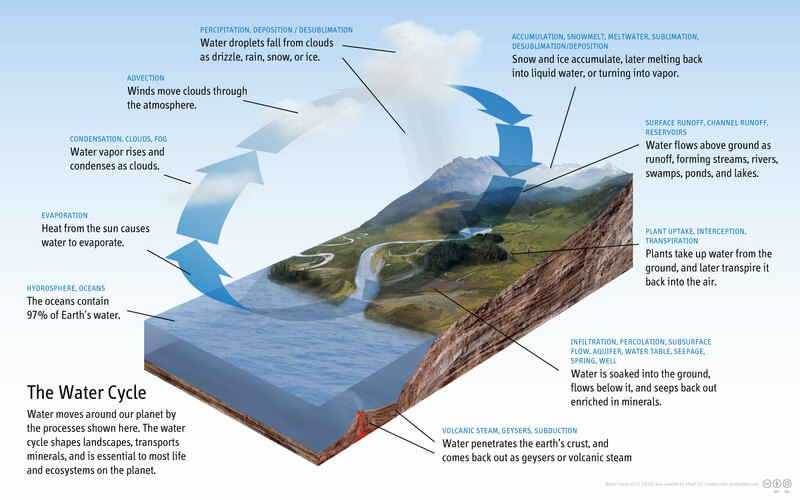 For example, the water cycle is a scientific concept that illustrates how water moves across the planet. Water from oceans, lakes, rivers, plants, and animals evaporates to form water droplets. These droplets condense into clouds, which release water as rain or snow that eventually flow back into oceans, lakes, rivers, plants, and animals. Concepts are generalizations, and because of this they provide a useful way to organize complexity. To use the water cycle example, we all experience aspects of the water cycle every day — for example, through sweating or getting caught in a rainstorm. However, we rarely think about how our experience fits into larger environmental processes. The concept of the water cycle allows us to see how lots of seemingly isolated events are linked together across the planet.